Soothes, moisturizes & protects. Excellent for irritated skin, it's formulated with 100% Pure, Cold-Pressed Black Cumin Seed oil & Aloe Vera. 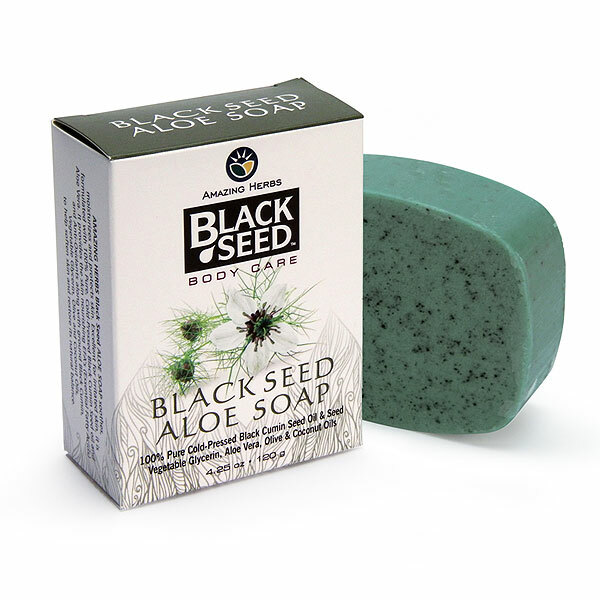 4.25oz (120g) — AMAZING HERBS Black Seed ALOE SOAP soothes, moisturizes and protects skin. Excellent for irritated skin, it is formulated with 100% Pure, Cold-Pressed Black Cumin Seed oil and Aloe Vera. It provides the skin nourishing EFA’s (Essential Fatty Acids) and Anti-Oxidants along with ground Black Cumin, Vegetable Glycerin, Olive and Coconut Oils, to help soften skin and restore its natural balance. INGREDIENTS: Saponified Vegetable Oils of Olive, Coconut, and Palm. Vegetable Glycerin, Emulsifier, Conditioner, Sorbitol, Water, Aloe Vera, and Black Cumin Seed oil and seed powder, Fragrance, FD&C Colors. NEW! 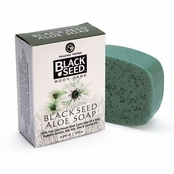 Awaken Rough Dry Skin with Black Cumin Seed Oil & Nurturing Plant Extracts. NEW! Awaken Rough Dry Skin with Black Cumin Seed oil and Nurturing Plant Extracts. Hydrates and attracts moisture to skin. Excellent for sensitive skin. Helps soften skin and restore its natural balance. Black Seed Honey & Oatmeal gently exfoliates and moisturize dry, flaky skin. Help soften skin and restore its natural balance.